"Backstop Portal made it simple for us to securely distribute account and research information to our clients." What is the Backstop Portal? 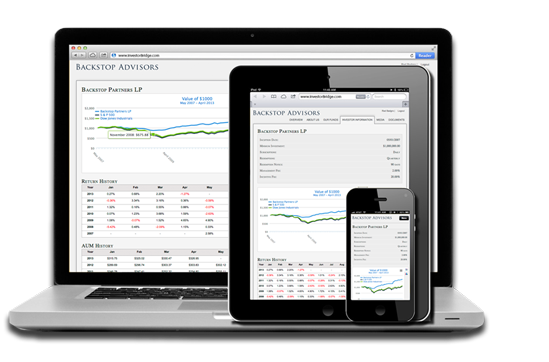 Backstop Portal is a fully customizable, web-based reporting portal that helps to satisfy the increasingly heavy demands of investors for access to investment and portfolio-related information. Backstop Portal is ideal for delivering documents, fund research and account information to investors and partners in a visually stunning, easy-to-use package. Our user permission system ensures that each visitor to your site receives only the information that is relevant to them. We also integrate other security features that rival an online banking experience. Backstop Portal is the perfect solution for IR professionals looking to provide investors with online access to account, fund and marketing information. 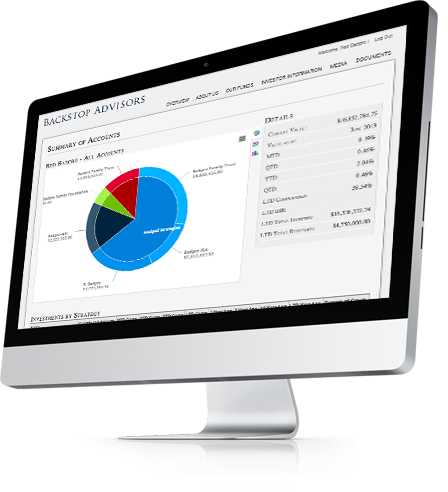 Backstop Portal allows funds of funds, endowments, family offices, and other institutional investors to provide transparency into their portfolios. The Backstop Portal charting technology provides a dynamic way to showcase your data to current and potential investors. You have already put in the hard work – sharing your research and performance should be the easy part.